Home > Synchronous Belts > One Sided Timing Belts (Single Side Synchronous Belts) > HTD Timing Belts. Round (Curvilinear) Tooth Profile > 710-5M-30 Synchronous Timing Belt. Neoprene. 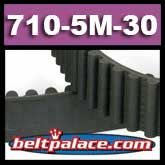 710-5M-30 Synchronous Timing Belt. Neoprene. 710-5M-30 Timing Belt. Neoprene Timing Belt. Round tooth profile. 710mm Length x 5mm Pitch x 30mm Wide. 142 Teeth.